The symposium will be about a subject which, strictly speaking, is not a subject at all. It is the road not taken: an opportunity missed, a word not spoken, a life not lived. One variation on this theme is the story of a middle-aged or old character who looks back on his life, in a more or less melancholy mood, pondering a career he has not had or a relationship he has not embarked upon (e.g. James, “The Beast in the Jungle”; Beckett, Krapp’s Last Tape; Ishiguro, The Remains of the Day). But the road not taken need not always be a good thing missed. It could also be the primrose path of dalliance or any other highroad to ruin avoided by sheer luck, by divine intervention, or because insight came just in time. An example would be Prospero’s renunciation of vengeance in The Tempest or Christian’s not following the way to Hell in Bunyan’s The Pilgrim’s Progress. Another variant of the theme is the treatment of several plot developments that branch off from the same premises, as in John Fowles’s The French Lieutenant’s Woman (i.e. 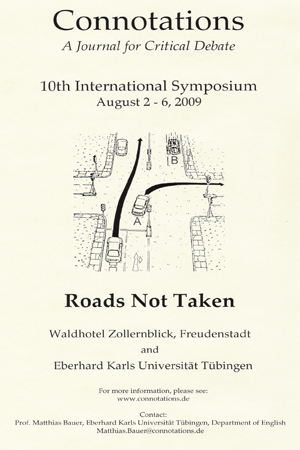 the roads not taken are treated as more or less equivalent with the one actually chosen). Questions to be dealt with include the following: How do the road taken and the road not taken compare with each other? Is an unlived life unfolded in great detail or is it merely suggested through pregnant details? Is it conveyed through the character’s memories and fantasies or is it represented through some other means? Do pre-modern texts emphasize nemesis avoided whereas modern ones focus on chances missed? 14:00 Myrtle Hooper (University of Zululand): "Going to marry": The Embodiment of Loss in Pauline Smith's "The Pastor's Daughter"
15:00 Silvia Ammary (John Cabot University, Rome): "The Road Not Taken" in Hemingway's "The Snows of Kilimanjaro"
16:30 Elena Anastasaki (The Open University of Greece): Henry James's Double Bind: Chasing Identity in "The Jolly Corner"
9:30 Carolina Ferrer (Université du Québec à Montréal): All the Roads Taken: Jorge Luis Borges's "The Garden of Forking Paths"